Steven Spielberg's World War I epic based on Michael Morpurgo's novel will gallop to Blu-ray in April. 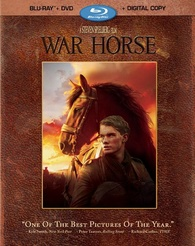 In an early announcement to retailers, Disney/Buena Vista is saddling up 'War Horse' for Blu-ray on April 3. The story follows Albert (Jeremy Irvine) who enlists to serve in World War I after his beloved horse is sold to the cavalry. The film has been nominated for six Academy Awards including Best Cinematography, Best Art Direction, Best Sound Editing, Best Sound Mixing, Best Original Score (John Williams) and Best Picture. Specs have yet to be finalized, but the Blu-ray/DVD/Digital Copy combo pack will include an assortment of featurettes: War Horse: The Journey Home, A Filmmaking Journey, Through the Producer's Lens, Editing and Scoring, An Extra's Point of View, and The Sounds of War Horse. Suggested list price for the Blu-ray is still to be determined. You can find the latest specs for 'War Horse' linked from our Blu-ray Release Schedule, where it's indexed under April 3.